Teachers deserve to get the feedback and support that are necessary to make learning as powerful as possible—for both their students and themselves. Based on research from the Bill & Melinda Gates Foundation and the experiences of nearly 3,000 teachers across the United States, Vicki Phillips and Lynn Olson reveal multiple ways to identify effective teaching and provide teachers with actionable, reliable information they can trust to continuously improve their performance. Teachers and administrators will learn how and why it’s critical to (1) measure effective teaching, (2) ensure high-quality data, and (3) invest in improvement. 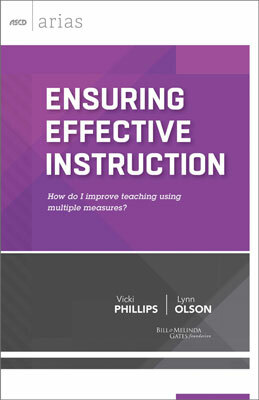 Armed with practical ideas for getting started at both the school and district levels, Phillips and Olson remind us that the best way to evaluate teaching performance is to use a balanced approach that includes multiple measures. VICKI PHILLIPS Director of Education, College Ready for the Bill & Melinda Gates Foundation, has committed her career to increasing educational opportunities for young people. Prior to joining the Gates Foundation, she was superintendent of Portland Public Schools (Oregon) and was secretary of education and chief state school officer for the state of Pennsylvania. LYNN OLSON is special assistant to the director of education at the Bill & Melinda Gates Foundation. She works to identify best teaching practices that can be replicated in classrooms throughout the country.